SFC Marcus V. Muralles died June 28, 2005, in eastern Afghanistan when his MH-47D Chinook Helicopter was shot down by enemy fire during combat operations. He was born October 5, 1971 in Louisiana, and was raised in Shelbyville, Ind. SFC Muralles joined the Army in December 1988 as an infantryman. After completion of Basic Combat Training and Advanced Individual Training he was assigned to 3rd Battalion, 75th Ranger Regiment, Fort Benning, Ga. After completing his initial enlistment obligation, he was assigned to the Inactive Ready Reserve in 1993. In August 1998 he returned to the active duty and graduated One Station Unit Training at Fort Benning in the summer of 1998. His first duty station was Company B, 3rd Battalion, 75th Ranger Regiment as a medical administrator, platoon medic, and company senior medic. 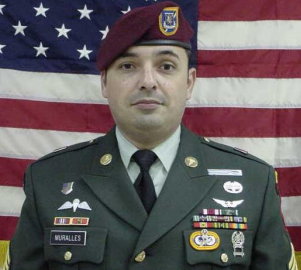 In August of 2003, SFC Muralles was assigned to 3rd Battalion, 160th Special Operations Aviation Regiment (Airborne) at Hunter Army Airfield, Ga. as an aerial flight medic. His military schools include: the Emergency Medical Technician's Course, the Basic Airborne Course, the Ranger School, the Primary Leadership Development, the U.S. Army Jumpmaster School, the Special Operations Training Course, the Special Operations Medic Course, the Basic Non-commissioned Officer Course, and the Army Advanced Noncommissioned Officer Course. SFC Muralles' military awards and decorations include: the Meritorious Service Medal, the Army Commendation Medal for Valor, the Army Commendation Medal (1 OLC), the Army Achievement Medal (3 OLC), the Good Conduct Medal (third award), the National Defense Service Medal w/Bronze Service Star, the Armed Forces Expeditionary Medal w/Bronze Service Star, the Humanitarian Service Medal, the Iraq Campaign Medal, the Afghanistan Campaign Medal, Global War on Terrorism Expeditionary Medal, Global War on Terrorism Service Medal, the Noncommissioned Officer Professional Development Ribbon w/numeral 3, the Army Service Ribbon, the Ranger Tab, the Combat Medical Badge, the Expert Infantry Badge, the Expert Field Medical Badge, the Aircraft Crew Member Badge, and Master Parachutist Badge with two combat jumps, the Expert Weapons Qualification Badge (rifle) and British Jump Wings. He was posthumously awarded the Bronze Star Medal, the Purple Heart, the Meritorious Service Medal, the Air Medal with Valor device and the Combat Action Badge. SFC Muralles is survived by his wife, Diana; their two children, Anna and Dominic; his father, Leonel; his mother and stepfather, Rosemarie and Robert, and his sister, Cindy. To go to the index of all our fallen hero's click here.